where there is a lawyer or legal expertise. 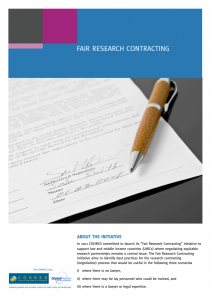 COHRED is proud to announce that the Rockefeller Foundation has awarded the Fair Research Contracting initiative with a fully funded “Bellagio Center Conference.” The Rockefeller Foundation Bellagio Center’s mission is to promote innovation and identify impact-oriented solutions to critical global problems. Bellagio conferences are small, focused, interactive gatherings designed to push creative and innovative thinking to address global challenges. Meeting Report: Click here to download the report to the meeting.